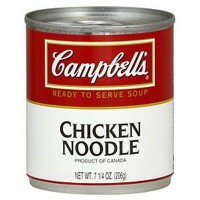 What American didn't grow up on Campbells Chicken Noodle Soup? Paired with saltine crackers or Pepperidge Farm Gold Fish Crackers, Campbell's Condensed Soup Chicken Noodle is a must-have staple in your pantry. Well-suited for lunch too, with a salad or a sandwich. 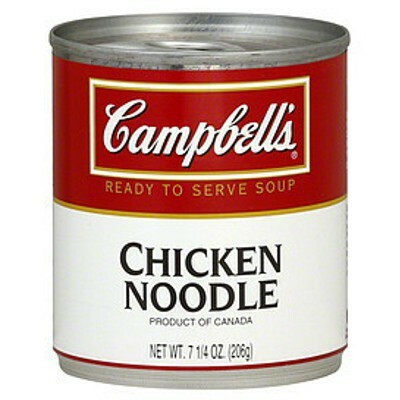 Campbell's Soup, mmm, mmm, good! Chicken stock, water, enriched egg noodles with added calcium (wheat flour, color E170, egg, egg white, ferrous sulfate [iron], vitamins B3-B1-B2-B9), less than 2% of: chicken meat, salt, potato starch, chicken fat, flavor enhancer E621, dehydrated chicken, flavoring, modified food starch, yeast extract, color E160a, antioxidant E339, soy protein isolate. Contains GMO. Nutrition facts (for 100g): calories 24Kcal, total fat 0.5g (saturated fat 0.2g), total carbohydrate 3.9g (sugar 0.5g), protein 1.5g, salt 1g.